String Extravaganza V was the penultimate concert in the 5 @ the First series – featuring Yehonatan Berick & Csaba Koczo on violin, Caitlin Boyle & Theresa Rudolph on the viola, and cellists Rachel Desoer & Rachel Mercer. Livia Coburn, a Bachelor of Music student at the University of Toronto currently studying under Shauna Rolston, opened with the prelude and gigue from Bach’s Suite #3 in C major on the cello. 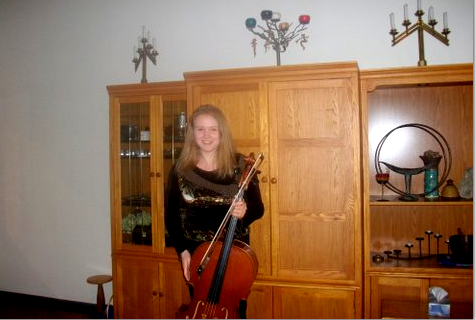 She is a very accomplished cellist and played the Bach with technical ability and understanding. Franz Schubert String Trio in B flat major was then expertly played by Berick, Rudolph and Mercer – appropriately spring-like, light and lilting. Schubert was 19 when he composed the piece, and the single movement is a classical nod to Hayden, Mozart and his teacher, Salieri, in allegro style displaying sparkle and wit. Next Koczo, Boyle and Desoer offered Ernst von Dohnanyi’s Serenade in C major, a work in five movements ranging from a very dramatic opening march, to a romantic second movement complete with an apparent lover’s tiff in the middle. Then there is a very busy and fun Scherzo, and an intense, sad and darkly beautiful Tema con Variazoni, before it winds up with a cheery, lively rondo. The music was lush and gorgeous and many were surprised to learn that the composer, virtually unknown to Canadian audiences, was once more popular in his homeland than Bartok. But apparently his suspected Nazi sympathies, affected the playing of his music post WWII. Following intermission, all six musicians played the lovely Sextet in B flat major by Johannes Brahms – the sunnier of the two string sextets written by Brahms. In his introduction to the work, Berick announced that the music could only have been written for this combination of instruments. Although it begins with the darker tones of the cello and viola, the opening allegro is not somber, but full-bodied, and almost symphonic – Brahms at his less melancholy best. The Andante moderato offers variations that are dramatic and interweave almost effortlessly. Then the Allegro molto with all the liveliness of a drinking song, encouraged foot tapping – making it hard for the appreciative audience to maintain silence. The final movement, Poco Allegretto e grazioso, exhibited a cheerful exuberance and moved from being cozy, to electrifying, and back again, and ended on a happy note. This allowed the audience to give the performers a well-deserved standing ovation. The final concert in this series will take place on May 21st, 2016 – 3PM at First Unitarian Church, Hamilton.